2 Main Message(s) 1. Low frequency spatiality (envelopment) is beautiful. 2. We perceive it through fluctuations in the apparent azimuth of low frequency signals. 3. 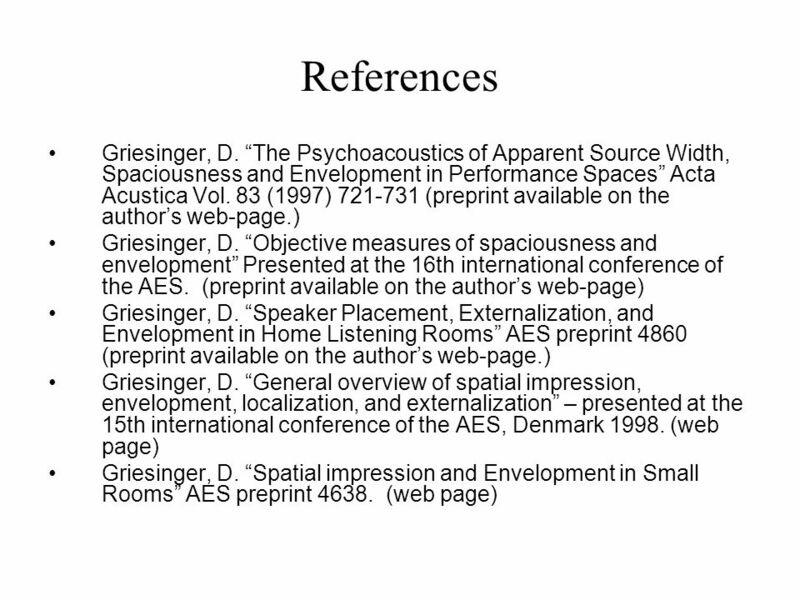 Fluctuations are produced by the acoustics of large spaces, and not by small spaces. We must reproduce them from information in the recording. 4. A suitable recording must contain decorrelated reverberation in at least two channels. 5. 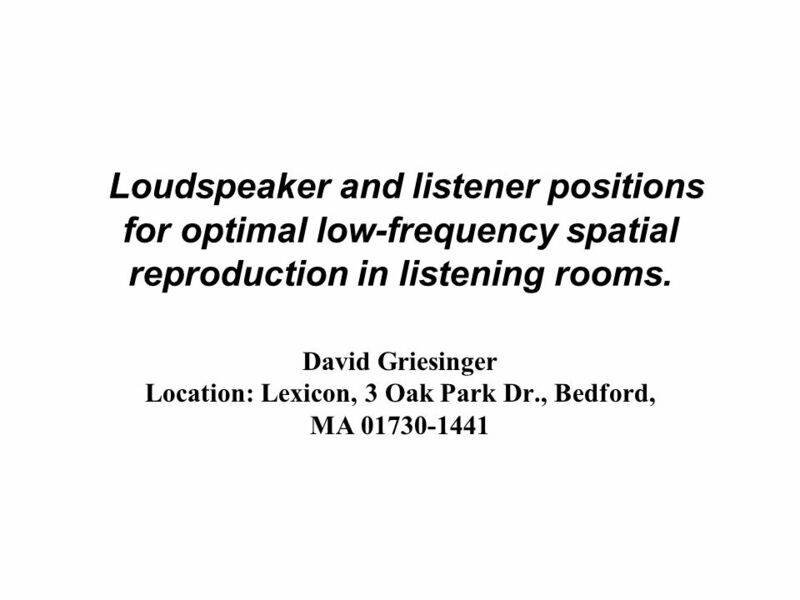 Reproducing the perception of envelopment from a recording requires least two full-range speakers. 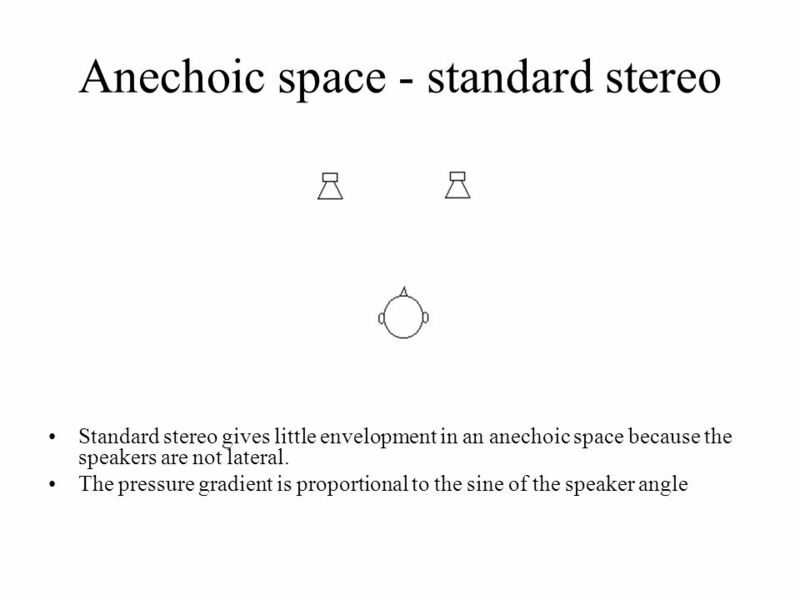 In anechoic space these speakers should be at the sides of the listener 6. 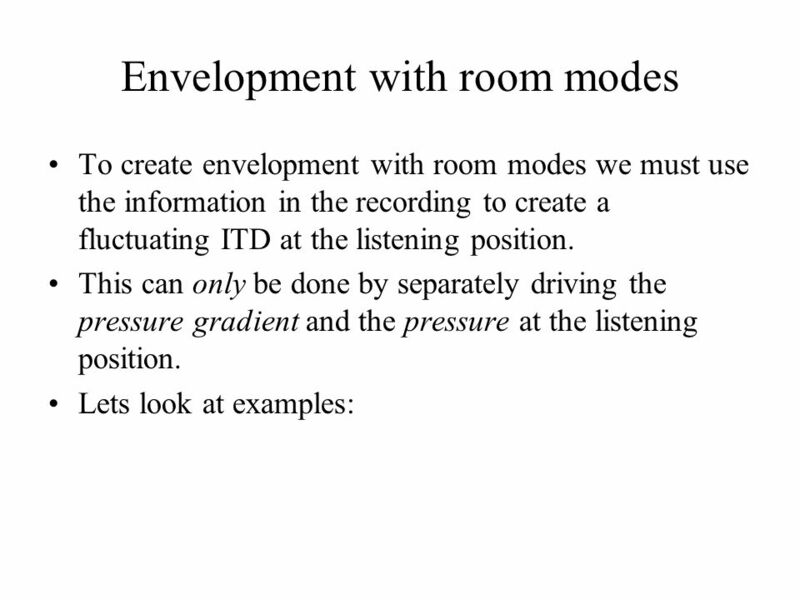 Perceiving envelopment in a small room requires that the pressure gradient at the listening position should be independent of the pressure. And that each should be driven by an independent component of the recorded reverberation 7. The above conditions are most commonly met when pressure gradients produced by assymetric lateral room modes overlap with pressure from medial modes. The overlap must be both in frequency and at the location of the listener. 8. Room dimensions and loudspeaker placements are critical. Their effects can be predicted by diagrams of the first few room modes. Pictured – the Deutches Staatsoper, Berlin A Lares system has been in constant use for many years. The principle benefit of this system is to increase low frequency envelopment. The Lares system is not perceived by the audience as adding to the reverberation. The system is considered essential for the production of most operas and all ballets. With the system on the low frequencies “come alive”, giving the audience a feeling of direct involvement with both the music and the emotion of the scene. 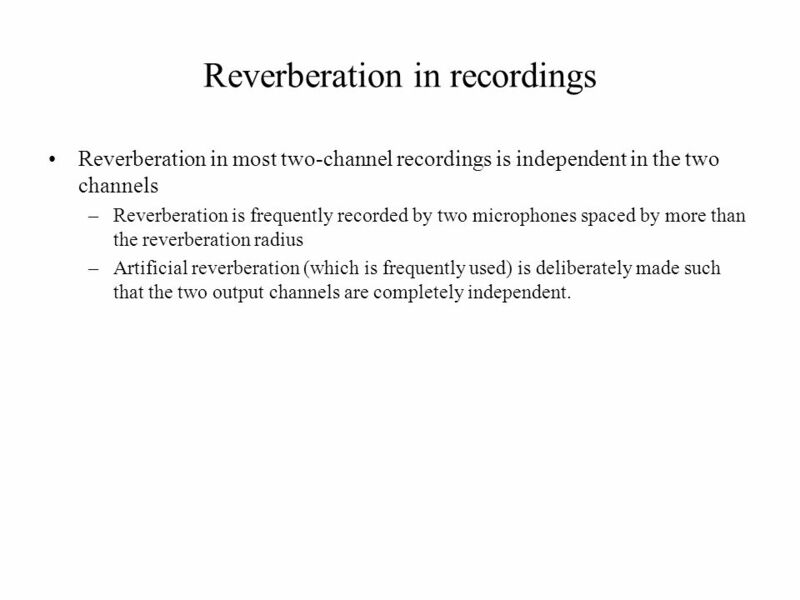 Reverberation in most two-channel recordings is independent in the two channels Reverberation is frequently recorded by two microphones spaced by more than the reverberation radius Artificial reverberation (which is frequently used) is deliberately made such that the two output channels are completely independent. 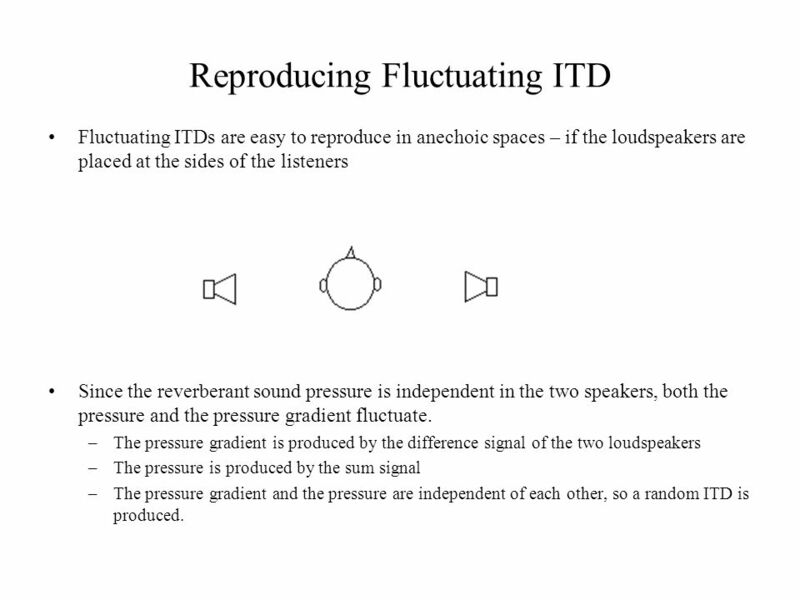 Fluctuating ITDs are easy to reproduce in anechoic spaces – if the loudspeakers are placed at the sides of the listeners Since the reverberant sound pressure is independent in the two speakers, both the pressure and the pressure gradient fluctuate. The pressure gradient is produced by the difference signal of the two loudspeakers The pressure is produced by the sum signal The pressure gradient and the pressure are independent of each other, so a random ITD is produced. 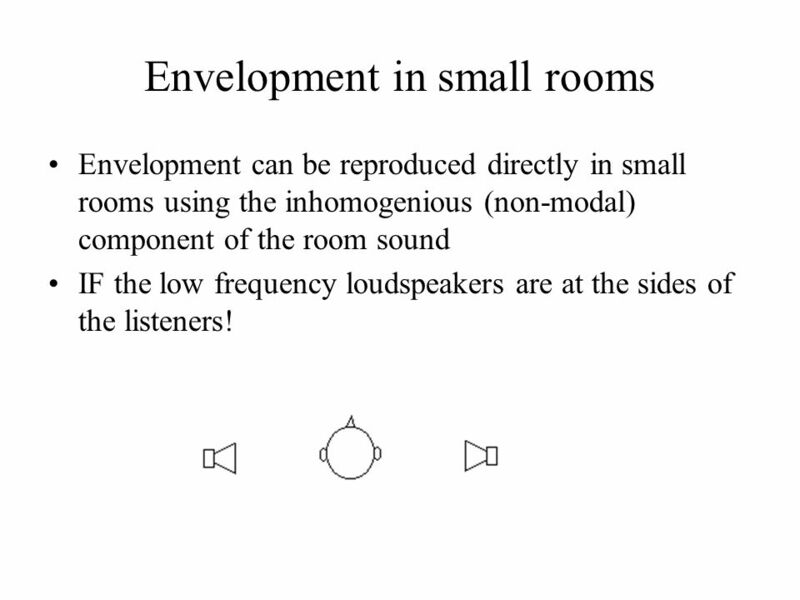 Envelopment can be reproduced directly in small rooms using the inhomogenious (non-modal) component of the room sound IF the low frequency loudspeakers are at the sides of the listeners! 10 Large room at HSG at 32Hz The large demo room at HSG is 17’x23’x9’. 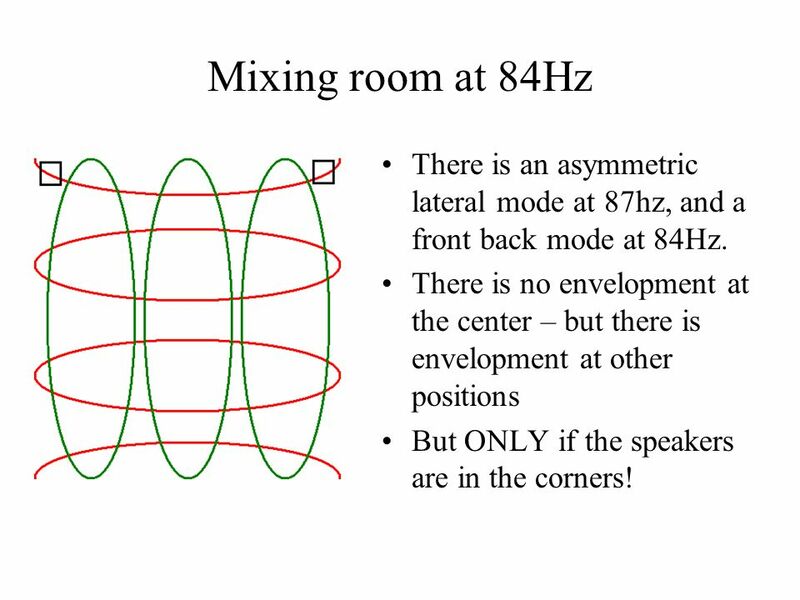 The front/back mode at 48Hz has a pressure maximum at the center of the room. 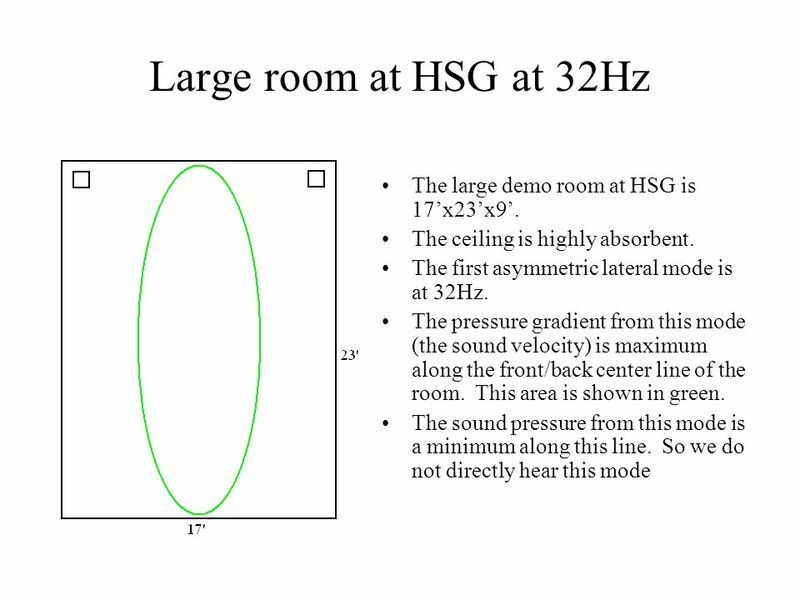 (shown in red) Note that the 48Hz pressure mode overlaps the pressure gradient from the 32Hz mode in the center of the room. The 32Hz mode is driven by the difference signal from the loudspeakers, and the 48Hz mode is driven by the sum signal. 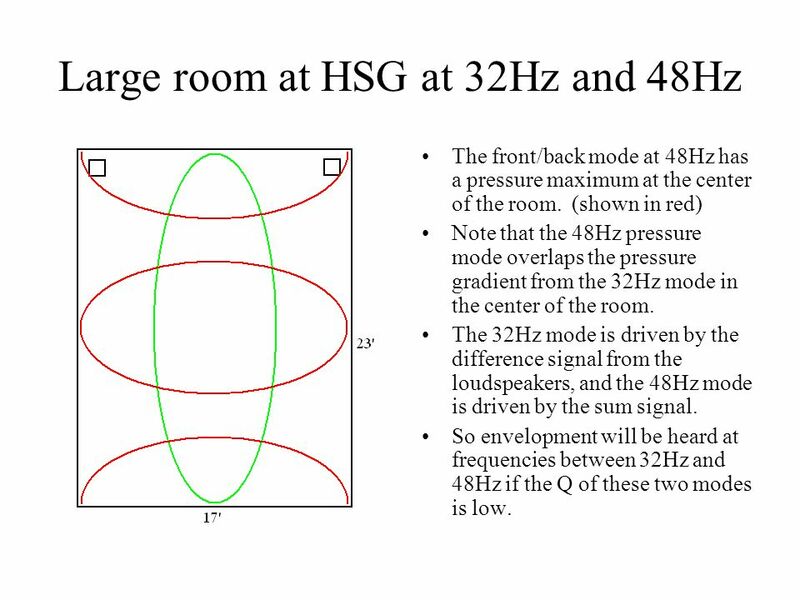 So envelopment will be heard at frequencies between 32Hz and 48Hz if the Q of these two modes is low. 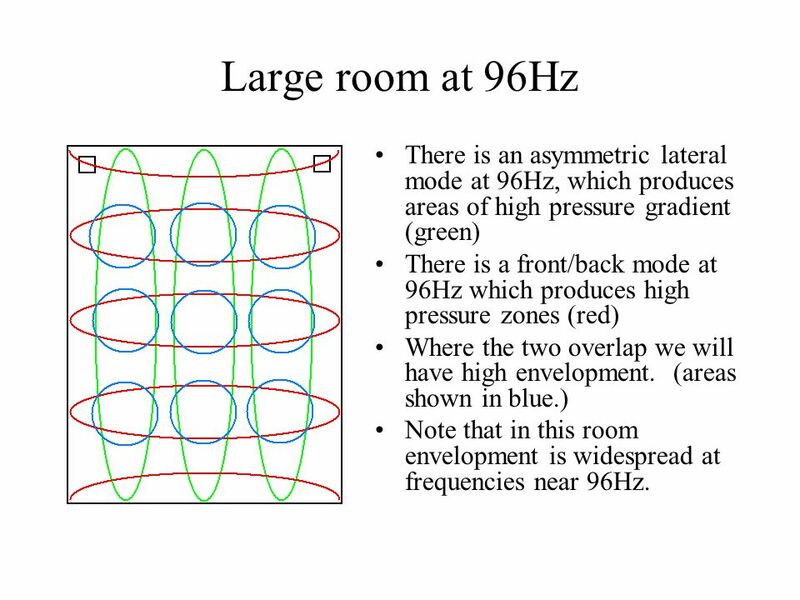 12 Large room at 96Hz There is an asymmetric lateral mode at 96Hz, which produces areas of high pressure gradient (green) There is a front/back mode at 96Hz which produces high pressure zones (red) Where the two overlap we will have high envelopment. (areas shown in blue.) 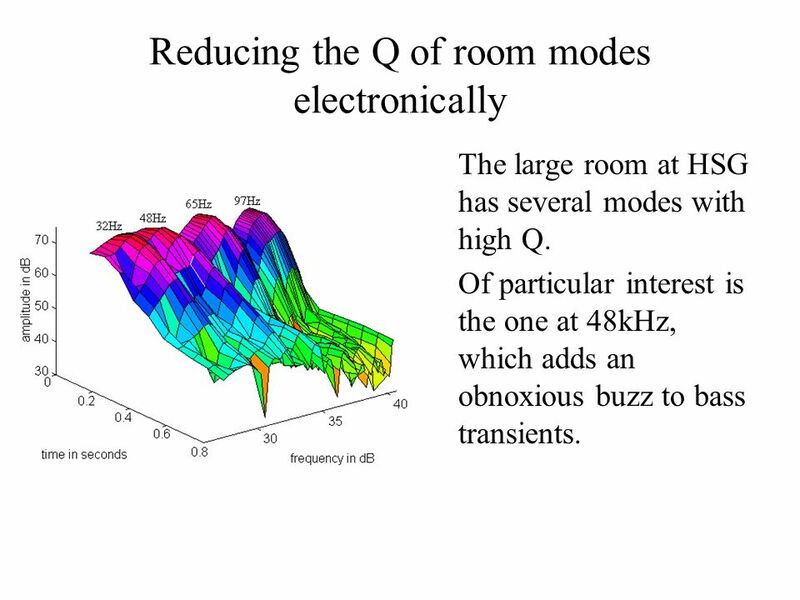 Note that in this room envelopment is widespread at frequencies near 96Hz. The mixing room has dimensions of 19’x21’x9’. The ceiling is absorbing. The room is nearly square (bad idea) At ~30Hz the assymetric lateral mode produces a pressure gradient shown in green. The ~30Hz front/back mode produces the pressure zones shown in red. Notice there is NO overlap in the center of the room – which was the listening position. There is thus no envelopment at these frequencies. 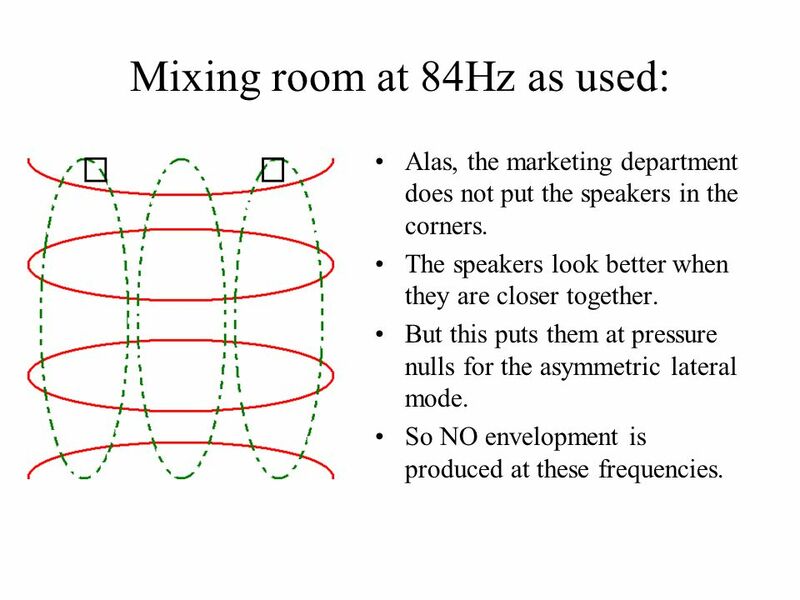 14 Mixing room at 84Hz There is an asymmetric lateral mode at 87hz, and a front back mode at 84Hz. There is no envelopment at the center – but there is envelopment at other positions But ONLY if the speakers are in the corners! Alas, the marketing department does not put the speakers in the corners. The speakers look better when they are closer together. But this puts them at pressure nulls for the asymmetric lateral mode. So NO envelopment is produced at these frequencies. 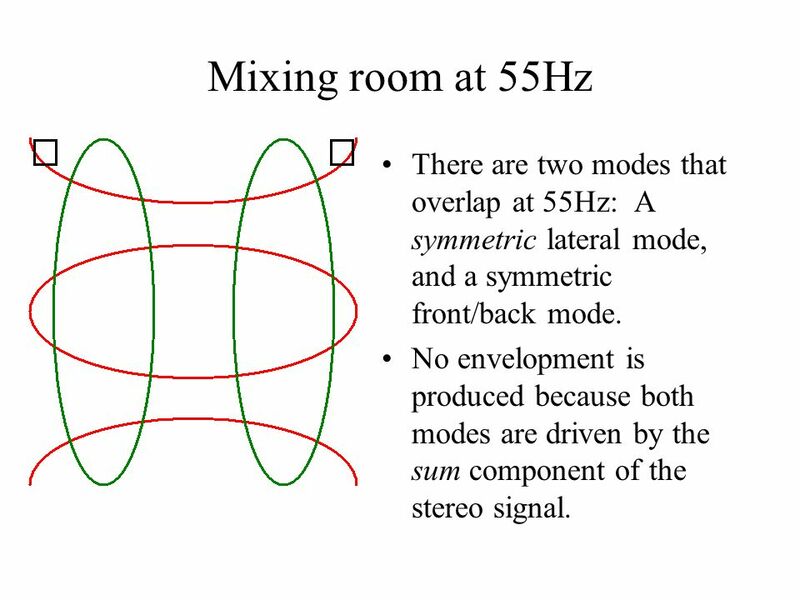 16 Mixing room at 55Hz There are two modes that overlap at 55Hz: A symmetric lateral mode, and a symmetric front/back mode. No envelopment is produced because both modes are driven by the sum component of the stereo signal. If we move the listening position to the left, we can produce envelopment at 55Hz. Although we are using the same modes as the previous slide, now the lateral mode is excited by the difference signal in the recording. This speaker arrangement also produces some envelopment at 30Hz, because the lateral mode is driven by the left speaker only. This arrangement is one of the best for this room – but envelopment is still poor compared to the Large room. 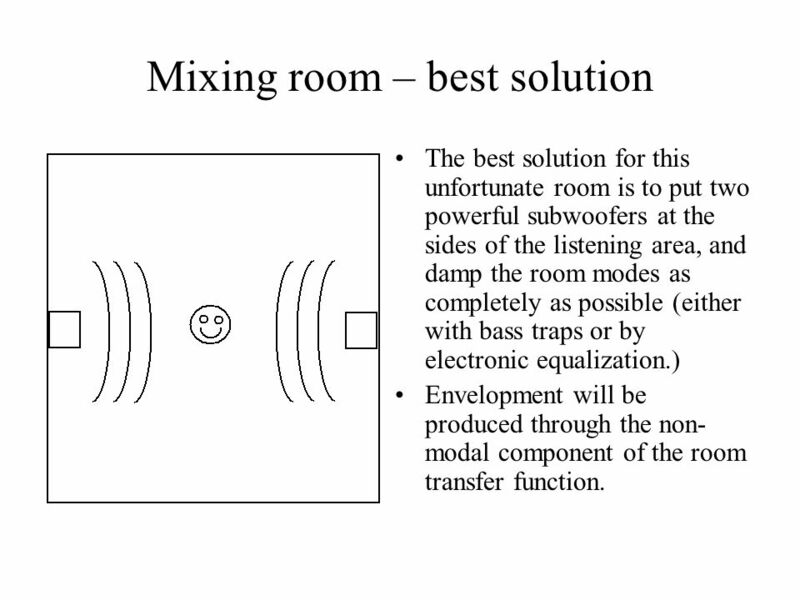 The best solution for this unfortunate room is to put two powerful subwoofers at the sides of the listening area, and damp the room modes as completely as possible (either with bass traps or by electronic equalization.) Envelopment will be produced through the non-modal component of the room transfer function. 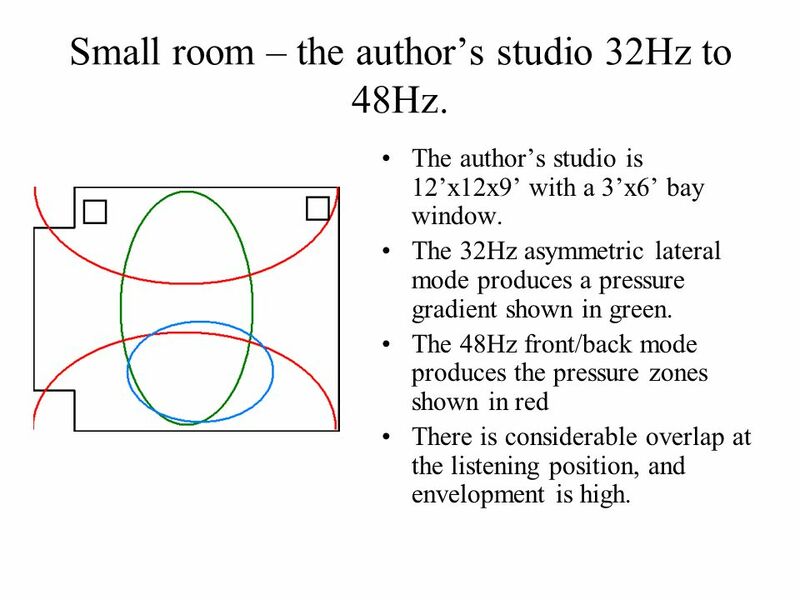 19 Small room – the author’s studio 32Hz to 48Hz. The author’s studio is 12’x12x9’ with a 3’x6’ bay window. The 32Hz asymmetric lateral mode produces a pressure gradient shown in green. The 48Hz front/back mode produces the pressure zones shown in red There is considerable overlap at the listening position, and envelopment is high. 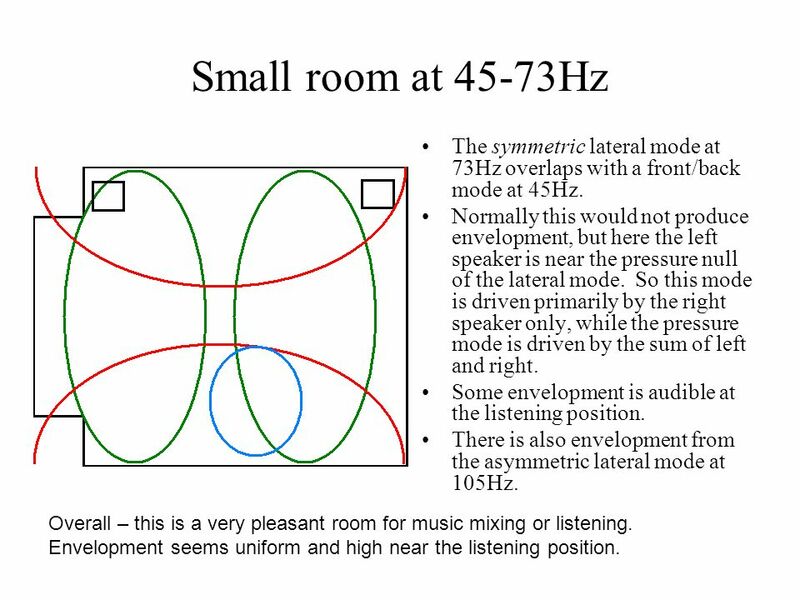 20 Small room at 45-73Hz The symmetric lateral mode at 73Hz overlaps with a front/back mode at 45Hz. Normally this would not produce envelopment, but here the left speaker is near the pressure null of the lateral mode. So this mode is driven primarily by the right speaker only, while the pressure mode is driven by the sum of left and right. Some envelopment is audible at the listening position. There is also envelopment from the asymmetric lateral mode at 105Hz. Overall – this is a very pleasant room for music mixing or listening. Envelopment seems uniform and high near the listening position. All speaker configurations with the speakers pointing along the long axis of the room sound poor in this space. The first asymmetric lateral mode is at 46Hz, and the overlap with pressure is poor. The next asymmetric lateral mode is at 138Hz, which is too high to give a spacious bass. Conclusion – the speaker positions along the long wall have advantages for envelopment because they maximize the overlap between the lateral pressure gradient and the total pressure. 22 Envelopment in the front/back direction. All the discussion so far has assumed the listener is facing forward. The assumption is seledom true. The same arguments can be applied to the front/back direction. If we want envelopment to be high in both directions (which is highly desirable) we need at least three LF drivers. (and four is better.) We also need at least one additional decorrelated source channel. (we can derive this using Logic 7) The large room at HSG is a good example of a room which is excellent in both directions. It sounds uniformly spacious as you rotate your head. 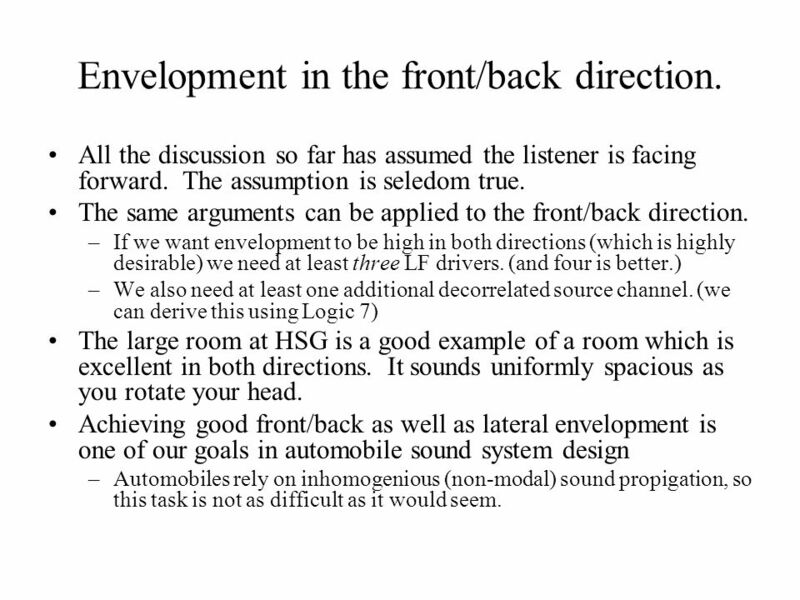 Achieving good front/back as well as lateral envelopment is one of our goals in automobile sound system design Automobiles rely on inhomogenious (non-modal) sound propigation, so this task is not as difficult as it would seem. 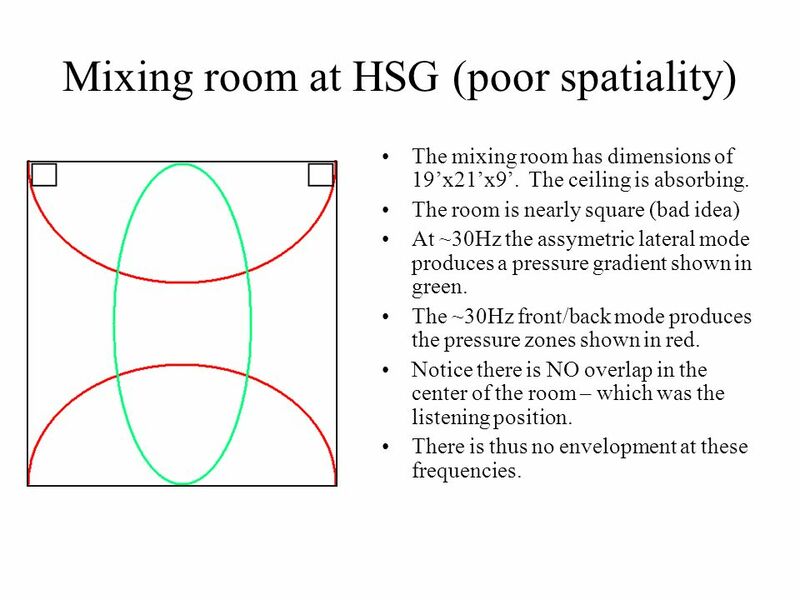 The large room at HSG has several modes with high Q. Of particular interest is the one at 48kHz, which adds an obnoxious buzz to bass transients. 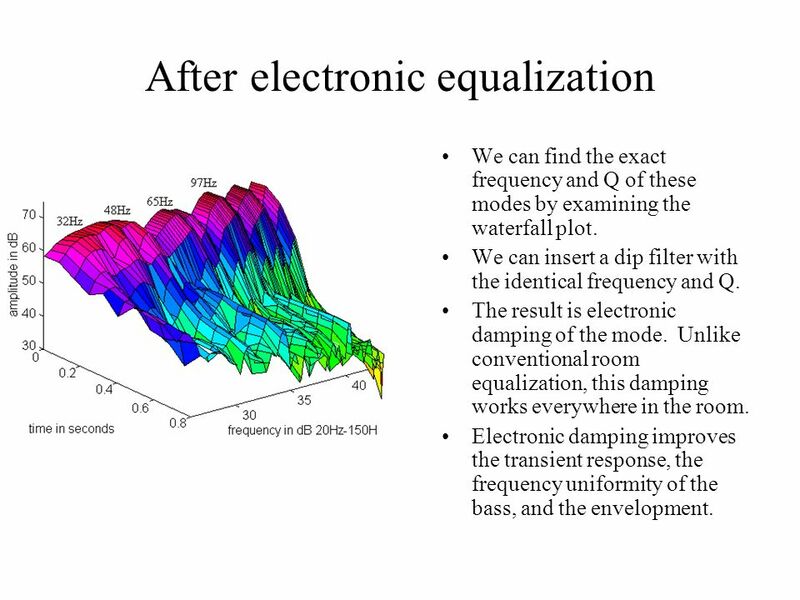 We can find the exact frequency and Q of these modes by examining the waterfall plot. We can insert a dip filter with the identical frequency and Q. The result is electronic damping of the mode. Unlike conventional room equalization, this damping works everywhere in the room. Electronic damping improves the transient response, the frequency uniformity of the bass, and the envelopment. 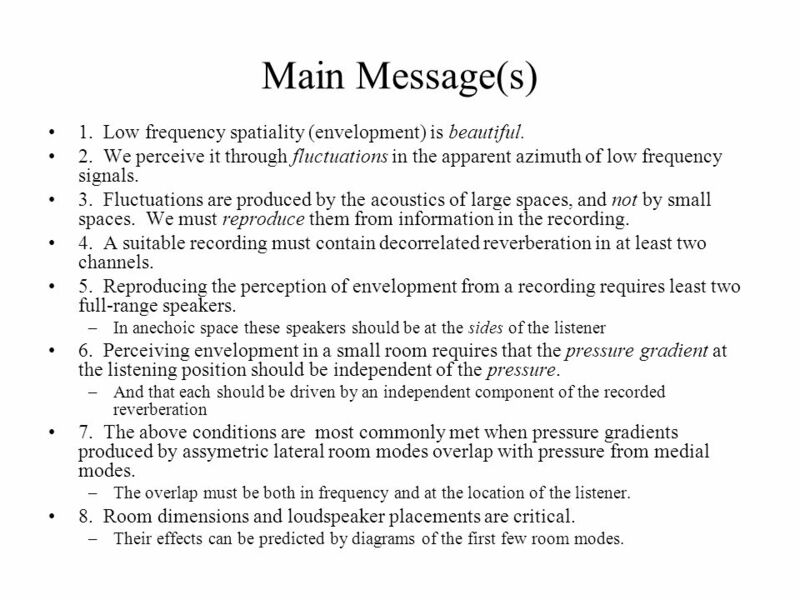 25 Conclusions The perception of envelopment with sound reproduction in small rooms is possible and desirable. 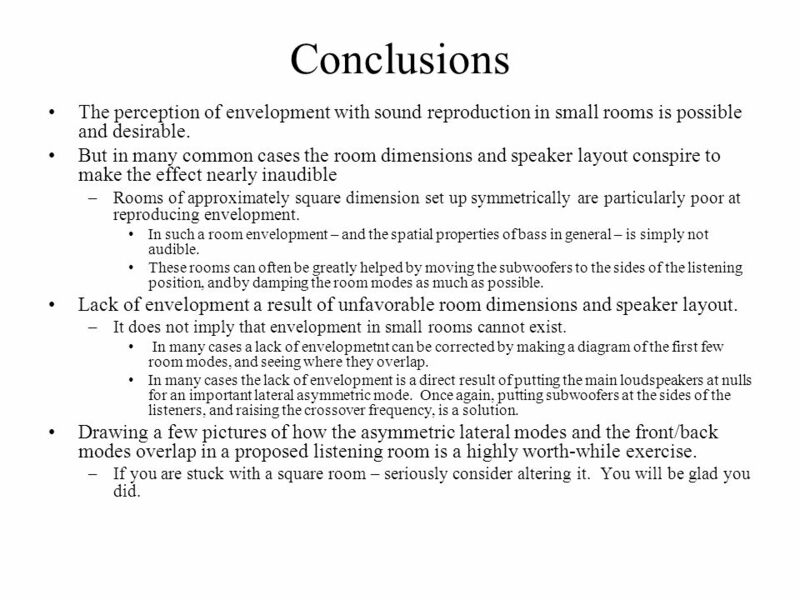 But in many common cases the room dimensions and speaker layout conspire to make the effect nearly inaudible Rooms of approximately square dimension set up symmetrically are particularly poor at reproducing envelopment. In such a room envelopment – and the spatial properties of bass in general – is simply not audible. These rooms can often be greatly helped by moving the subwoofers to the sides of the listening position, and by damping the room modes as much as possible. Lack of envelopment a result of unfavorable room dimensions and speaker layout. It does not imply that envelopment in small rooms cannot exist. In many cases a lack of envelopmetnt can be corrected by making a diagram of the first few room modes, and seeing where they overlap. 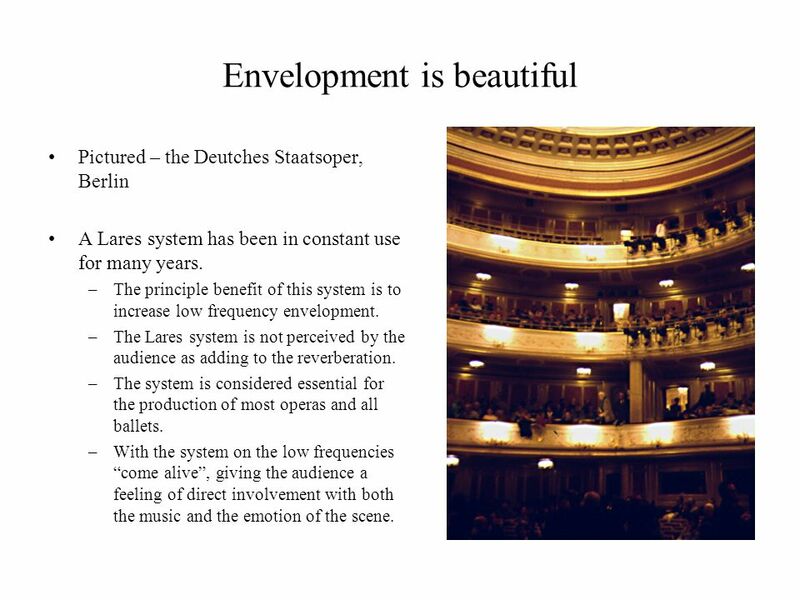 In many cases the lack of envelopment is a direct result of putting the main loudspeakers at nulls for an important lateral asymmetric mode. Once again, putting subwoofers at the sides of the listeners, and raising the crossover frequency, is a solution. 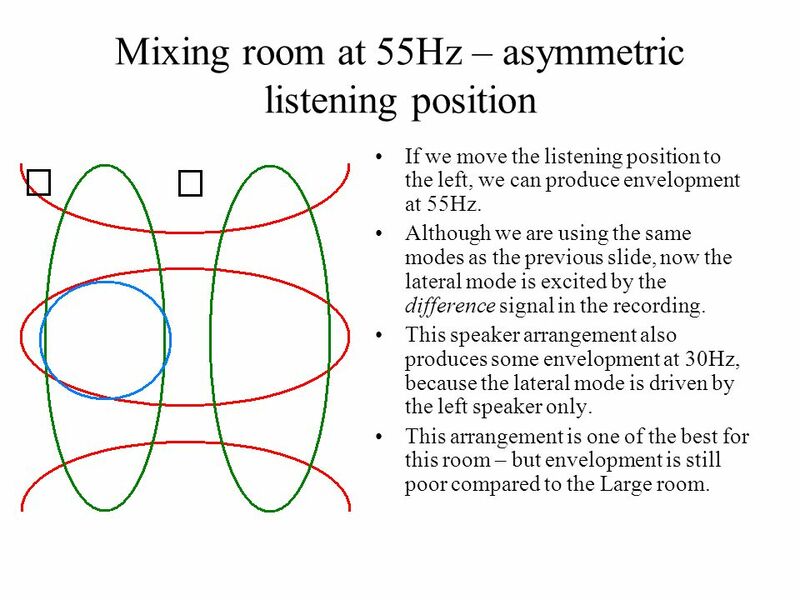 Drawing a few pictures of how the asymmetric lateral modes and the front/back modes overlap in a proposed listening room is a highly worth-while exercise. If you are stuck with a square room – seriously consider altering it. You will be glad you did. 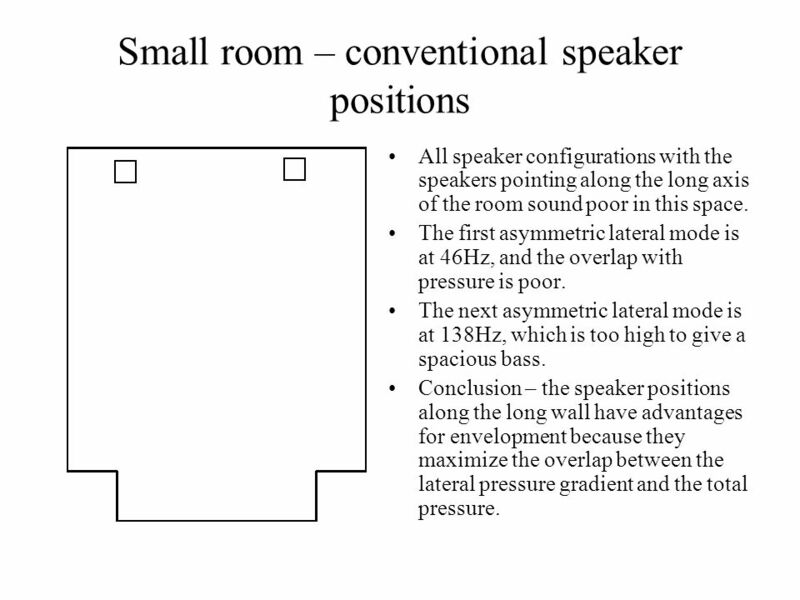 Download ppt "Loudspeaker and listener positions for optimal low-frequency spatial reproduction in listening rooms. David Griesinger Location: Lexicon, 3 Oak Park Dr.,"
Researches and Applications for Automotive Field Andrea Azzali, Eraldo Carpanoni, Angelo Farina University of Parma. RAY SUB TECHNOLOGY. DIRECTIONAL SUBWOOFERS BENEFITS. Morset Sound Development Sound System Calibration Example - Performing Monitor Calibration in Studios. 1 POWERPOINT May 2004 To move the text box - move the mouse over the border of the text box, and once the 4-way arrow appear – click and drag the box. UH page: 1 / Sept nd Intl. AES Conference “DSP for Loudspeakers” Hillerod, Denmark Application of Linear-Phase Digital Crossover. Acoustics and Concert Halls Stephanie Hsu March 21, 2005. 1 3D sound reproduction with “OPSODIS” and its commercial applications Takashi Takeuchi, PhD Chief Technical Officer OPSODIS Limited Institute of Sound. 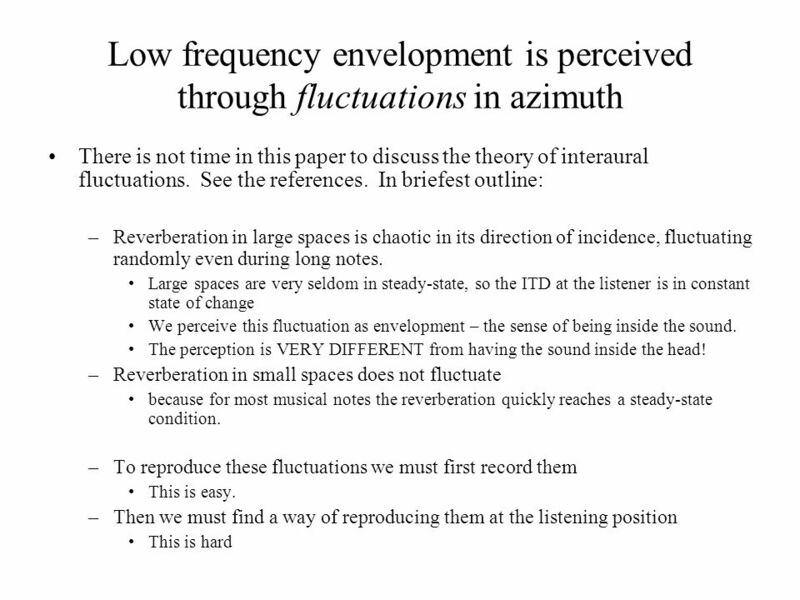 L INKWITZ L AB S e n s i b l e R e p r o d u c t i o n & R e c o r d i n g o f A u d i t o r y S c e n e s Hearing Spatial Detail in Stereo Recordings.